It's been a while since I've done one of these. I've been pretty busy writing things for theleafsnation.com, who asked me to start contributing over there a while ago midway through this series. I always planned on finishing the series here, and so that's what I'm starting on now. The last one of these I wrote was on May 24, on the now-traded Scott Harrington. On Tuesday, it was announced that Martin Marincin would file for arbitration, along with Peter Holland and Frank Corrado. My posts on those two can be found by clicking on their names. Marincin was a depth defenseman picked up from the Edmonton Oilers for a 4th round pick and Brad Ross (sent over to balance contracts only). He played 65 games last season, scoring 7 points with just one goal. There was a time before the Matt Martin signing that Martin Marincin was unquestionably the most divisive player in the Leafs' system. Largely a bottom-pairing defenseman, the young and large man showed a balance of promising and worrysome play, to the point where no one (who doesn't pay attention to advanced stats) knew what kind of player he really was. 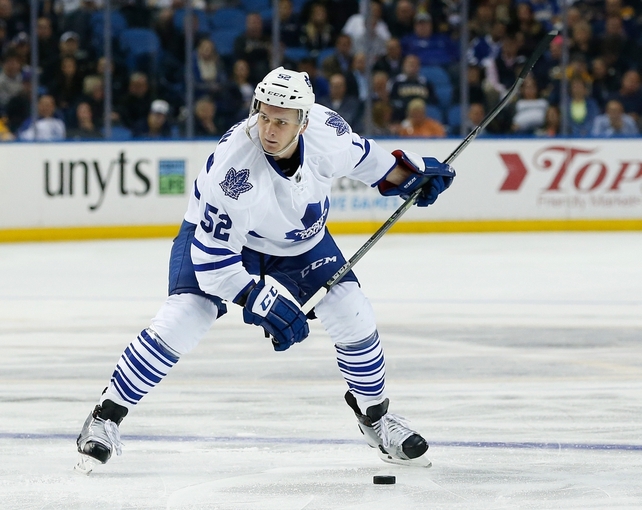 Just 24 years old going into next season (same age as young stud defenseman Nikita Zaitsev), Marincin is entering the prime years of his career. He possesses a unique skillset where he doesn't use his size for physicality, but for stick reach to break up plays against and maintain plays for. One of the most touted skills for Marincin is preventing zone entries. Using the data tracked by Evan Baker, shown in this post, Marincin led the Leafs last season with the lowest rate of controlled zone entries allowed. Another skill I'm impressed by with Marincin, that isn't often discussed, is maintaining the offensive zone. He has posted a very good relative CA60 over the last 3 years (5.4 shot attempts per 60 fewer than his average teammates) despite not being stellar in his own zone. I believe that maintaining the offensive zone has a much stronger correlation to CA60 than actual defensive zone ability, which may be where the stark difference in opinion regarding his abilities comes from. Playing a shift in the offensive zone and then getting off is a much better way to prevent shots against than being a skillful defensive zone player. We can see above that when ice time (2nd graph) saw a sharp increase, and he was playing on the top pairing with Morgan Rielly (1st graph), his 5v5 Shot Attempts Against/60 (3rd graph) and Goals/Shot-on-goal (4th graph) went way up, and the opposite was true of his Shot Attempts For and Goals/Shot-on-goal. (If Micah, the creator of hockeyviz.com, sees this, he will not be happy that I changed Shots to Shot Attempts. But, in the interest of clarity, I proceed). It seems to me that Marincin is better suited for a bottom pairing role in the NHL. It seems like the best idea to contract Marincin as a bottom-four defenseman. His statistical comparables, from Corsica's Similarity Calculator are a rough outlook, comparing him usually to depth-at-best defensemen like Nikita Nikitin (2014-15), Clayton Stoner (2014-15 and 2015-16), Mark Stuart (2012-13) and Brett Lebda (2009-10). I have a hard time seeing Marincin make any kind of outrageous claim to fortune in his arbitration hearing, and I think he knows that. The Leafs interest in not letting it go to arbitration is they probably want Marincin on a 2 year deal in order to expose him to the expansion draft to Las Vegas. I've kept these things in mind when assessing the possible deals. This gets the Leafs exactly what they need: a cheap, good, bottom-pairing defender with some league value that could get selected in expansion. They would have to settle this deal prior to arbitration. This is the case where Dubas and the analytics-friendly front office value him a little higher, and are willing to overpay to get him on the 2 year deal they're likely searching for here. The absolute worst case here is that the Leafs let it go to arbitration, and his hearing is reasonable for both sides. This is what I could see it settling out to, but there's a pretty wide range of $1.6M to $2M where I could see the arbitration landing at. With only 7 points, at 23 years of age, and Corsi stats likely not applicable in the hearing (it would take the length of the hearing to explain their significance to the arbitrators), it's probably closer to the lower end of the range I suggested. Overall, the Leafs are not in any kind of pickle despite Marincin opting for arbitration. They will almost assuredly settle before the hearing to a deal that suits their interests, as Marincin has next to no leverage. The only name left in this series now is Josh Leivo, so stay tuned for that, the final episode.